Louisiana Voices Unit III Discovering the Obvious: Our Lives as "The Folk"
Introduction: Our Lives as "The Folk"
Discovering the Obvious: Our Lives as "The Folk"
We children played outside under the fig trees. 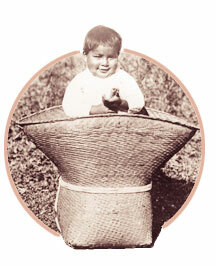 Emery Bourgeois was the farmer. I was his helper. Libbon . . . Bourgeois and his brothers, Mac and Willard, had filling stations. Howard may have been the engineer. I was the only girl farmer. Aunt Beulah reminded me of the many fights we had. Our whole machinery for the imaginary rice fields we planted were made from empty cans. Tin cans were treasured as toys. . . . Then we had to pretend we had wagons, horses, rice planters, and even a deep well, too. We made many canals and we would use the long handled water pump in the yard to irrigate our rice fields. The idea of "the folk" arose as 19th century European scholars began studying peasant life and looking for quaint old ways of doing things. For example, the Grimm Brothers collected many tales, which they later revised and published. Early folklore scholars collected ballads and tunes as well, searching for ancient songs. Today folklorists study many forms of traditional cultural expression, contemporary as well as from the past. They collect from all classes of people, not just rural residents or recent immigrants. Unit III introduces students to folklife concepts and definitions and, most importantly, grounds them in their own folklife so that they begin to see that everyone has folklife. By starting with themselves, students will be able to comprehend further folklife studies more fully. They will start to learn that many traditions cut across various folk groups, yet each family has its own unique folklife. If you undertake no other units in this guide, these lessons are the most important.